Christmas is largely about tradition, and sometimes it’s nice to watch the same old stuff: movies that celebrate Christmas for all its good qualities, its ability to bring people together and to get some people to be a little bit nicer to one another. The movies here are sure to get the cheer flowing. Happy Holidays to you all! If you’d rather skip the Christmas carols and good cheer, come back tomorrow when we’ll offer our favorite twisted holiday fare. 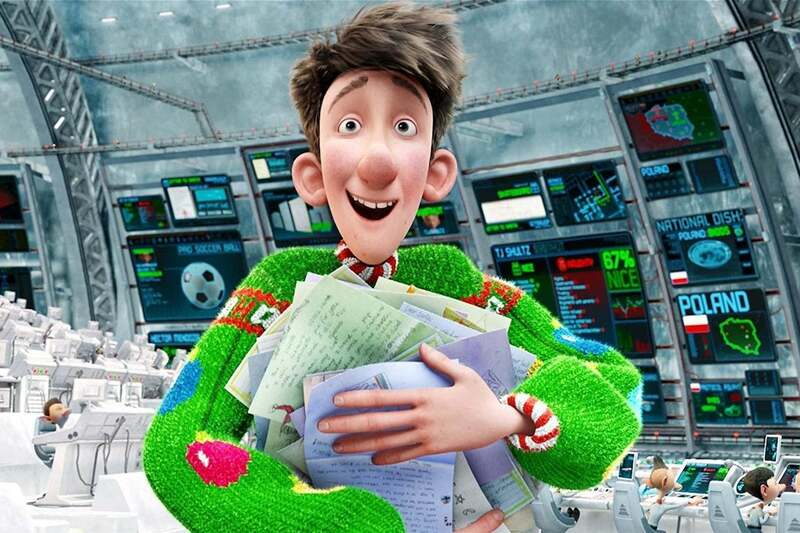 Santa’s ne’er-do-well son Arthur (voiced by James McAvoy) gets the chance to save Christmas in Arthur Christmas. Coming from Aardman Animations—the English company that brought us Wallace and Gromit—Arthur Christmas (2011) is one of the most hilarious, colorful, and exciting animated Christmas movies ever made. Arthur (voiced by James McAvoy) is the clumsy, cheery son of Santa Claus; he works in a little, brightly colored office answering letters to children, and he loves his job. His older brother Steve (voiced by Hugh Laurie), on the other hand, pretty much runs the high-tech operation of delivering presents to all the children in the world in one night, while the current Santa Claus (voiced by Jim Broadbent) seems to have reached retirement age. Late Christmas Eve, it becomes clear that a mistake has been made, a single present was not delivered, and it becomes Arthur’s job to make this right. Thus begins a thrilling, around-the-world adventure filled with funny characters and silly jokes. Directed by Sarah Smith and Barry Cook, the movie looks great, warm and smooth and bright, and moves with slick, enthralling energy. Somehow, this lovable film didn’t do well in American theaters in its day, but it’s worthy of an annual viewing. Babe the pig (voiced by Christine Cavanaugh) saves the farm by becoming a sheepherder in Babe. Early in the summer of 1995, there came a talking pig movie called Gordy that moviegoers quickly ignored. 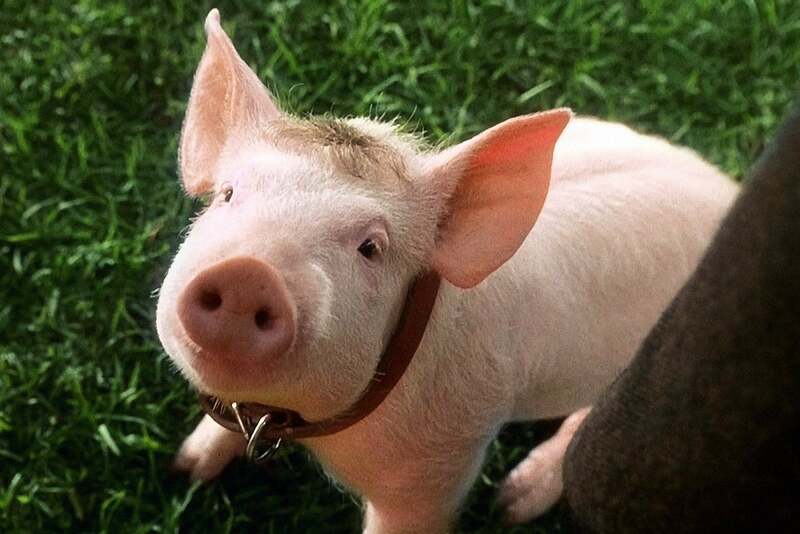 Thus, it was an enormous surprise when a second talking pig movie showed up, Babe (1995), that somehow turned into one of the best movies of the year, a huge hit, and an Oscar nominee for Best Picture. In it, Farmer Hoggett (James Cromwell) wins a pig at the fair. As Babe grows up, befriended by the farm’s dogs, he learns how to herd sheep. Hoggett notices, and when his champion dog is injured, he decides to risk ridicule from all his colleagues and enter Babe in a sheepherding contest. Australian filmmaker George Miller—known for his four Mad Max films—co-wrote the screenplay and produced, handing directing duties to Chris Noonan; the result is seamless, and endlessly delightful. The effects, a blend of real animals, animatronics, and computer animation, won an Oscar. The Christmas sequence isn’t very long, but it contains some of the movie’s funniest stuff—the look on Hoggett’s face when his hand-crafted gift is opened is priceless—and besides, this is a movie that easily entertains viewers of all ages. Magda Szubanski co-stars as Hoggett’s chatterbox wife Esme. 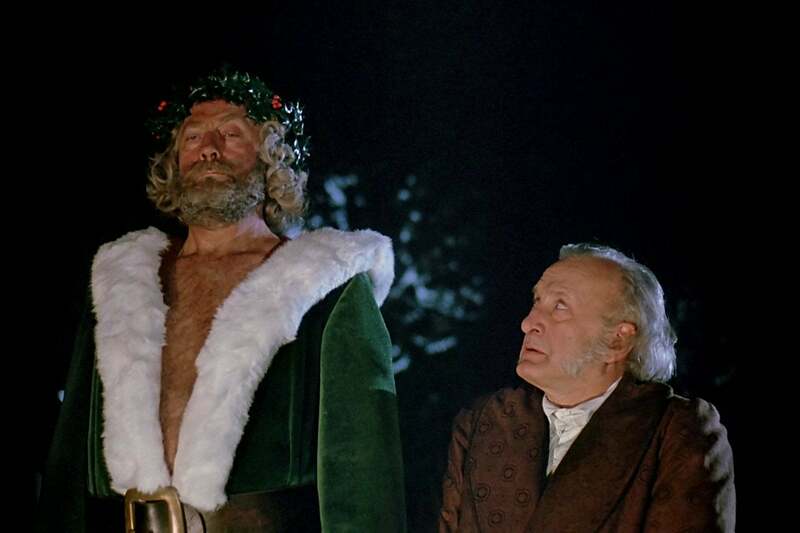 The Ghost of Christmas Present (Edward Woodward) shows Scrooge (George C. Scott) the true meaning of the holiday in just one of many version of A Christmas Carol. The American A Christmas Carol (1938) was produced at MGM and has some excellent set and costume design, despite its brief 69 minutes. Reginald Owen plays everyone’s favorite miser, Gene Lockhart is Bob Cratchit, and Leo G. Carroll is Marley’s Ghost. The 1984 version was made for television and feels a bit chintzy, and its Tiny Tim looks like a deer in the headlights, but George C. Scott is a great Scrooge, and David Warner (a noted bad guy in movies like Time Bandits and Tron) is Bob Cratchit. Finally, there is a highly truncated, 24-minute TV version called Charles Dickens’ The Christmas Carol (1949) that is totally unremarkable except for one unbelievably cool facet: It’s narrated on camera by a bearded Vincent Price! 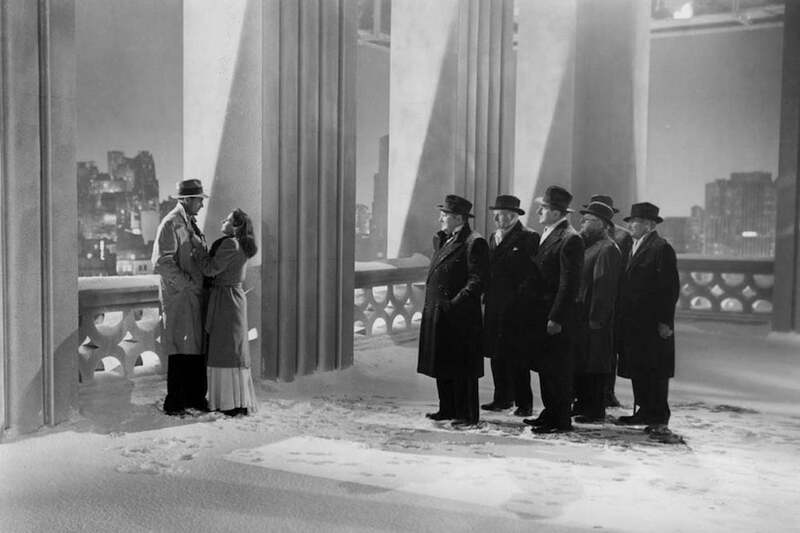 Barbara Stanwyck tries to create the perfect holiday setting in Christmas in Connecticut, with Sydney Greenstreet and Dennis Morgan. After Meet John Doe (1941), this is the second Christmas film in which Barbara Stanwyck plays a columnist whose work is not entirely factual. 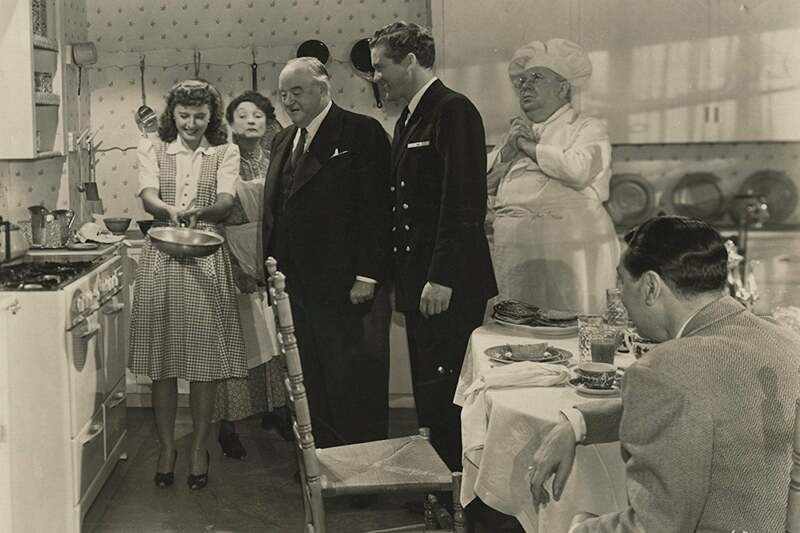 In Christmas in Connecticut (1945), she plays food writer Elizabeth Lane, who writes a magazine column about a totally phony life, a farm, and a husband and child. Her publisher (Sydney Greenstreet) doesn’t know about the deception, so when a war hero (Dennis Morgan) wants to meet her, she is forced to create everything from scratch, borrowing a farm, a staff, a husband, and even a neighbor’s baby. Of course, the entire movie is a scramble to keep up the ruse, with the inevitable denouncement and romantic coupling, but it has an old-fashioned charm. As one of the greatest of all screen actresses, Stanwyck’s skill is unmatched, and she manages to sell the chaos admirably. Some great character actors, including Greenstreet, S.Z. Sakall, and Una O’Connor, offer strong support. Infamously, Arnold Schwarzenegger directed a 1992, made-for-TV remake that is, they say, better forgotten. 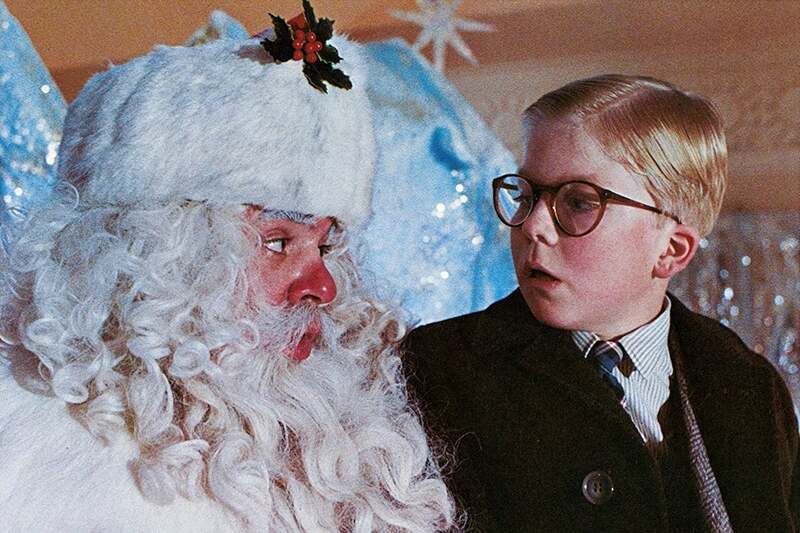 Ralphie (Peter Billingsley) has a disconcerting visit with Santa (Jeff Gillen) in A Christmas Story. Sure, everyone has seen it a million times, and it plays on TV in marathons during the holidays, but Bob Clark’s A Christmas Story (1983) is still a classic, and still capable of eliciting smiles and good cheer. Based on writings by Jean Shepherd, the movie is a nostalgic memory of childhood, and cooks up the brilliant idea of Peter Billingsley playing young Ralphie on screen, with Shepherd narrating from an adult’s point of view. It consists mostly of episodes, connected by Ralphie’s coveting of the Red Ryder Carbine Action 200-shot Range Model air rifle for Christmas. (Everyone famously responds, “You’ll shoot your eye out, kid.”) Otherwise, there are bullies, tongues stuck to frozen poles, the leg lamp, the next door neighbor’s dogs, mouths washed out with soap, radio shows, and a grumpy furnace. Director Clark had previously made the great Christmas horror film Black Christmas, and he brings a little horror to this one in the form of a scary visit to a mall Santa Claus. The ghost of Irena (Simone Simon) appears to an imaginative little girl at Christmas in The Curse of the Cat People. 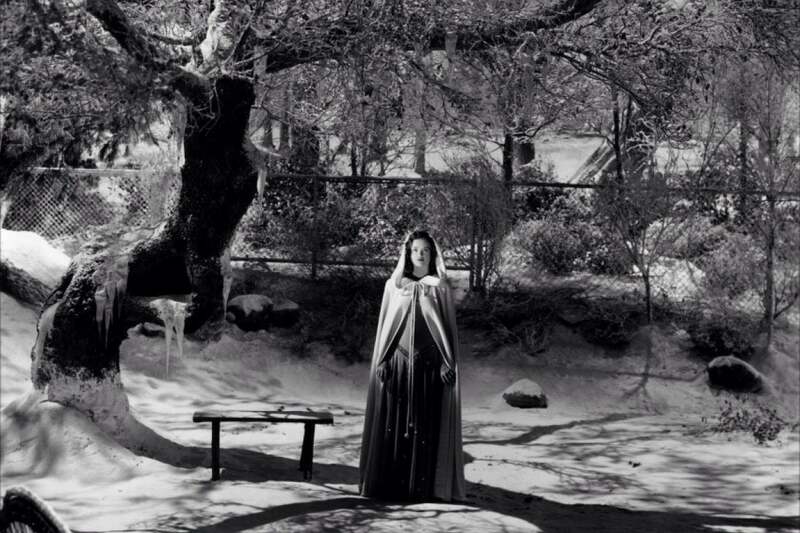 What on earth does The Curse of the Cat People (1944) have to do with Christmas? Quite a lot. In 1942, RKO hired genius producer Val Lewton to make a “B” horror film called Cat People; he did, and he made it with uncommon grace and intelligence, and it was a huge hit. So the studio ordered a sequel. But Lewton did not want to make a sequel, so instead he came up with this incredible, sympathetic story of child psychology. The hero (Kent Smith) from the original film is now re-married and has a daughter, Amy (Ann Carter). It’s Christmastime, and Amy has a strong imagination, so vivid that she even “imagines” seeing her father’s dead first wife, Irena (Simone Simon), the “cat woman” of the original movie. Her father has no patience for this nonsense and eventually he causes Amy to run away from home in a snowstorm. Future Oscar-winner Robert Wise made his directorial debut here, taking over from Gunther von Fritsch (fired for being too slow on a low-budget shoot), and he creates an adult story about a child, as well as a suburban wonderland, full of snow, beautiful decorations, and ghostly and spooky things. At a holiday feast, Gretta (Anjelica Huston, left) is visited by a memory from her past in John Huston’s The Dead. John Huston made one of the most assured movie debuts in history (The Maltese Falcon) and subsequently spent more than 40 years as a maverick, taking risks with challenging, powerful material and failing perhaps more often than succeeding. 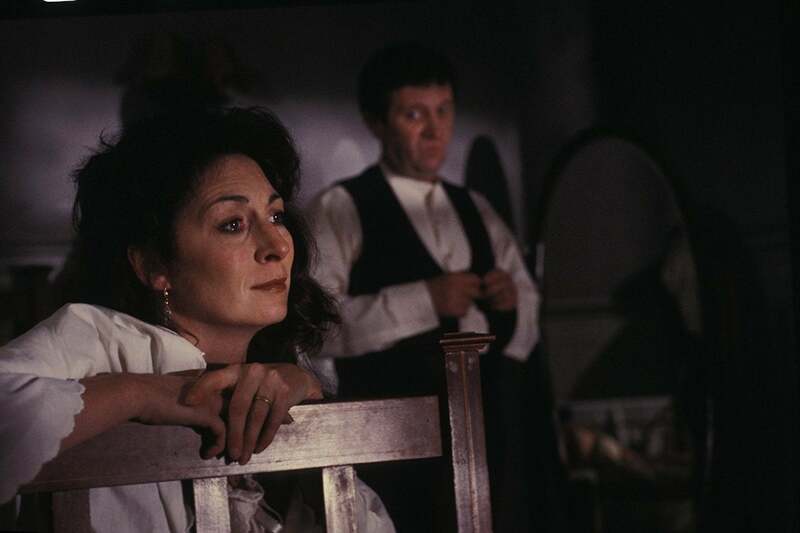 But when he succeeded, he did so wonderfully, as in his final film, the quiet, touching The Dead (1987), based on James Joyce’s classic short story. This beautiful, wintry, introspective holiday masterpiece takes place a few days into January, during a traditional Irish family feast. Gorgeous food is prepared, and various family members arrive, each with their own little dramas. Freddy (Donal Donnelly) has been drinking too much, and the kindly Gabriel (Donal McCann) worries about his dinnertime speech. As the events unfold over the course of the evening, it causes Gabriel’s wife Gretta (Anjelica Huston) to remember a past event that she finally chooses to share with Gabriel. The ill Huston directed from a wheelchair and breathing through an oxygen tank, and the movie subsequently has a patient, quiet feel. His son Tony adapted the screenplay. Will Ferrell plays “Buddy,” a human raised as a Christmas elf who goes seeking his real father in Elf. 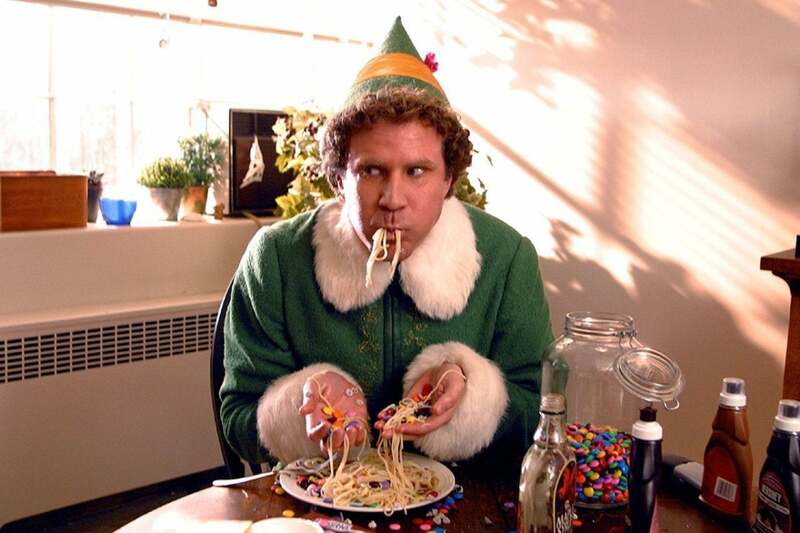 Elf (2003) made a box office star out of Will Ferrell and catapulted director Jon Favreau to the “A” list, and it remains a hilarious, kindhearted, and beloved holiday favorite, released, weirdly, around the same time as Bad Santa. Ferrell stars as “Buddy,” a human raised by Santa’s elves (the joke is funnier considering Ferrell’s 6’3” stature). The magical North Pole sequences are meant to recall classic TV Christmas specials, complete with a stop-motion-animated narwhal. Upon learning that he is not actually elf-born, he decides to go to New York City to find his real father, a cranky children’s book publisher (James Caan). Ferrell’s total dedication to the part, a kind of girlish innocence, really makes this fly. His line readings of his ridiculously naïve dialogue (“what’s your favorite color?” “smiling’s my favorite!,” etc.) is unfailingly hilarious. An earthy performance by Zooey Deschanel, who works in a department store in an elf costume, perfectly compliments him. (Their duet of “Baby, It’s Cold Outside” is a keeper.) Peter Dinklage makes a very funny appearance as a successful children’s author. Bob Newhart narrates the story as Buddy’s elf “papa,” and Ed Asner is a cranky Santa Claus! Alexander (Bertil Guve) enjoys one perfect Christmas before life takes a left turn in Ingmar Bergman’s Fanny and Alexander. The master Swedish filmmaker Ingmar Bergman announced his retirement after this three-hour familial epic (which was edited down from a five hour-plus Swedish TV mini-series), and thus he seemed to throw everything he had into Fanny and Alexander (1983). It’s arguably the most accessible and personal film in the great director’s career. Though it introduces many members of a large family, it essentially focuses on the title children, especially 10-year-old Alexander (Bertil Guve), who is clearly the one Bergman identifies with. When Fanny (Pernilla Allwin) and Alexander’s father suddenly dies, their mother marries a bishop, who turns out to be one of the most thoroughly hateful and evil of all movie villains, covering up his nasty, brutish behavior with piousness. However, the movie opens with a joyous, sad, and beautiful old-fashioned Christmas celebration, set in 1907, and taking up nearly an hour of the film’s 188-minute running time. It could almost be a little Christmas film all on its own. 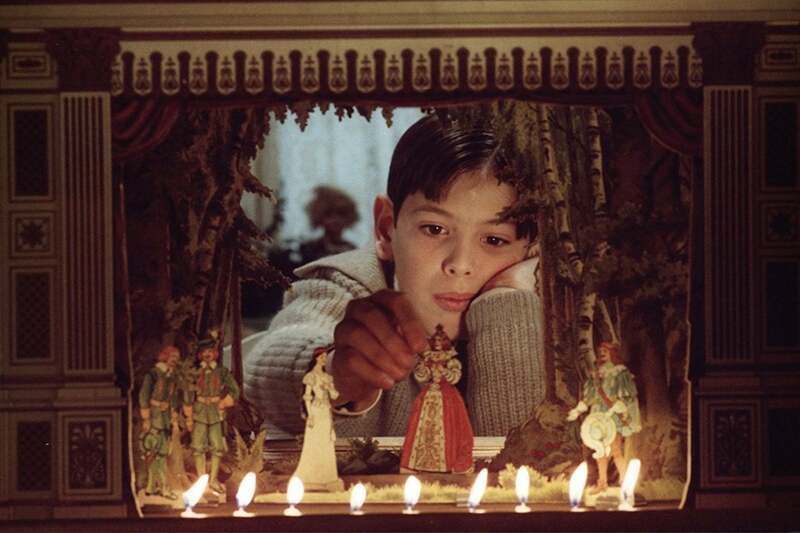 Fanny and Alexander went on to win an Oscar for Best Foreign Language Film, as well as Oscars for Costume, Set Design, and Cinematography, while Bergman was nominated for Best Screenplay and Best Director. Harry (Daniel Radcliffe), Hermione (Emma Watson), and Ron (Rupert Grint) get into trouble in Harry Potter and the Sorcerer’s Stone. Christmas makes a small but important appearance in Harry Potter and the Sorcerer’s Stone (2001), the first of the wildly successful movies adapted from J.K. Rowling’s equally successful novels. Hogwarts is magically decorated, and composer John Williams even contributes a delightful little Christmas composition to the score. On Christmas morning, Harry is surprised to learn that he has presents, and an extremely cool one at that: an invisibility cloak. 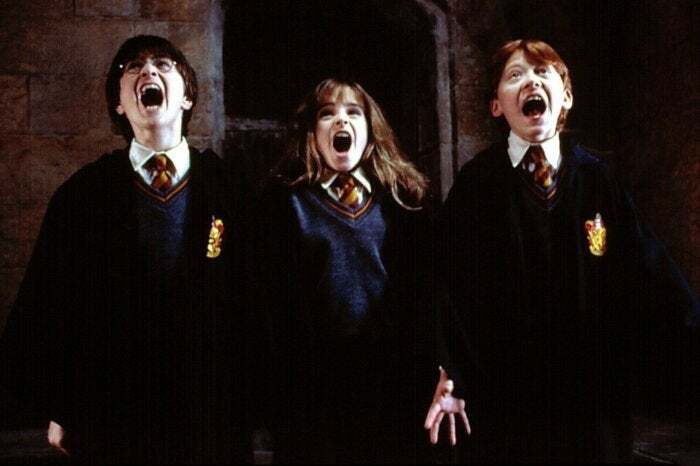 Daniel Radcliffe (as Harry Potter), Rupert Grint (as Ron Weasley), and Emma Watson (as Hermione Granger) seem impossibly young in their roles now that the series is finished, but they were all so perfectly cast. Directed by Chris Columbus, the movie looks great and slick and doesn’t offend or challenge in any way, so it’s perfect to put on while the whole family is around. Additionally, the fourth film in the series, Harry Potter and the Goblet of Fire (2005) has an even bigger Christmas sequence—the majestic Yule Ball—although it’s also a slightly edgier film. (L to R) Trini Alvarado, Winona Ryder, Kirsten Dunst, and Claire Danes endure hardship and glorious Christmases in Little Women. 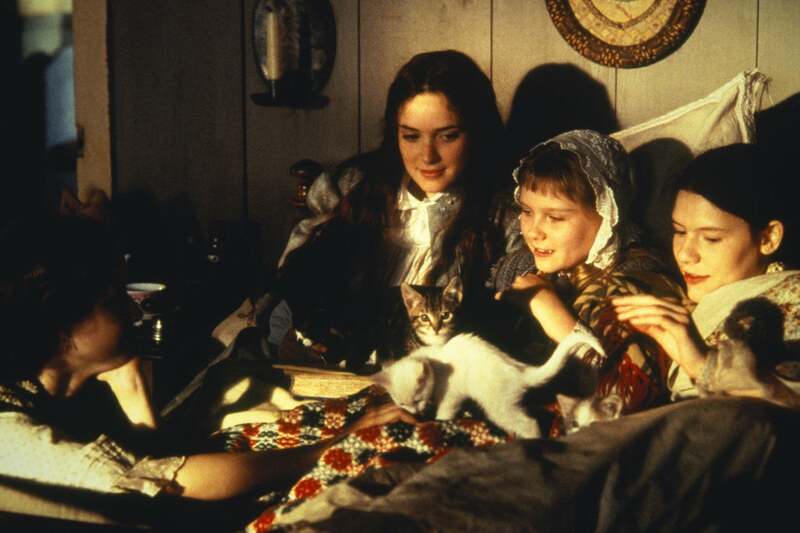 This Little Women (1994) is the third major, big-screen adaptation of Louisa May Alcott’s 19th century novel, with Winona Ryder taking on a role that was previously played by Katharine Hepburn and June Allyson, though only Ryder received an Oscar nomination for her work. The film tells the story of the trials and tribulations of the March family, led by matriarch Marmee (Susan Sarandon) and populated by four little women: firebrand Jo (Ryder), eldest sister Meg (Trini Alvarado), sweet, sickly Beth (Claire Danes) and the youngest, Amy (played by Kirsten Dunst as a child and Samantha Mathis as a young woman). Their father is at war, and there are fights and makeups, sicknesses and poverty, and Christmases galore. Men (Christian Bale, Eric Stoltz, Gabriel Byrne) come in and out of their lives, and Jo becomes the source for that oldest of movie cliches: She’s a writer and she’s going to write this particular story into a great novel. But, as directed by Australian-born Gillian Armstrong, it’s all quite beautiful and vivid and alive. It’s smart and sweet and completely affecting, especially the Christmas sequences filled with singing and generosity and goodness, all of which we can certainly use a little of this season. Barbara Stanwyck tries to make a symbol of “everyman” Gary Cooper in Frank Capra’s Meet John Doe. Frank Capra’s It’s a Wonderful Life (1946) is now one of the ultimate Christmas movies, but this year it is only available as a digital purchase, not rentable or streamable (it will be broadcast on television on Christmas Eve only). So as a decent substitute, there is always Capra’s Christmas-set cornball classic Meet John Doe (1941). This one still works because it’s totally heartfelt, and its message still feels like it could apply today. 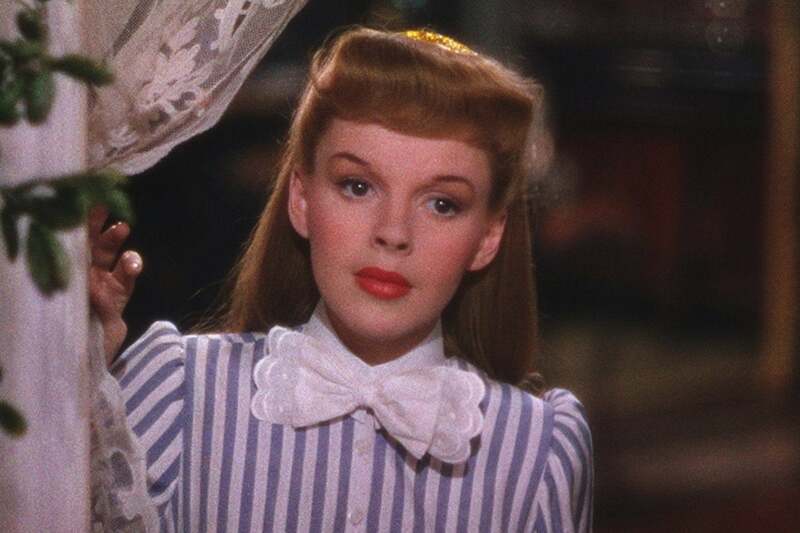 Esther Smith (Judy Garland) tries to make a lovely Christmas for her family in Meet Me in St. Louis. Vincente Minnelli’s full-color musical is a masterpiece, set over the course of an entire year, leading up to the 1904 St. Louis World’s Fair. The Smiths (Leon Ames and Mary Astor) have four spunky daughters, Rose (Lucille Bremer), Esther (Judy Garland), Agnes (Joan Carroll), and Tootie (Margaret O’Brien), most of them boy-crazy. There are many ups and downs as the girls plan romantic things, while the youngest, Tootie, causes her own kind of trouble. Everyone is devastated by the news that the family may have to leave St. Louis and move to New York. The startlingly beautiful film includes a surprisingly spooky Halloween scene, followed by a lovely Christmas ball. Esther sings “Have Yourself a Merry Little Christmas”—written for this movie—to a distraught Tootie, who destroys all the snowmen in the yard. Despite its downbeat moments, it’s a glorious movie, showing Minnelli’s astounding skill at its height. O’Brien won a special Oscar for her performance, and she still makes special appearances at screenings today. 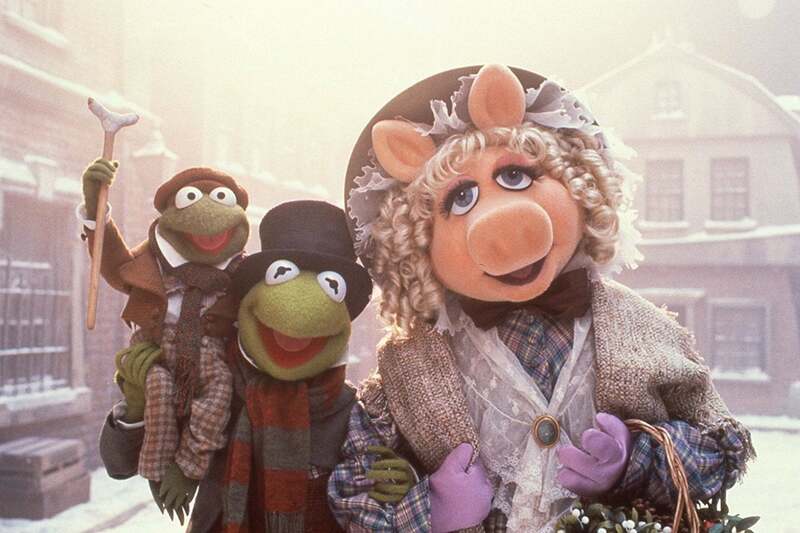 Kermit as Bob Cratchit (center), along with Robin and Miss Piggy, gets help from Scrooge in celebrating a fine Christmas in The Muppet Christmas Carol. Of course, Miss Piggy is here, as Emily Cratchit, and in a masterstroke of casting, Fozzie Bear plays that staple of Scrooge’s past, the Christmas party-loving “Fozziewig.” Gonzo, who claims to be Dickens, narrates the story along with Rizzo the Rat. Despite many clever, funny Muppet-style gags, the movie sticks fairly closely to the Charles Dickens story—except the Paul Williams songs, which are nice without being exactly memorable—and the result is unexpectedly touching and constantly funny. This was the first Muppet film after the untimely death of Jim Henson; Steve Whitmire takes over for the voice of Kermit. Henson’s son Brian directed. James Stewart doesn’t realize that Margaret Sullavan is his secret pen-pal in The Shop Around the Corner. People remember Jimmy Stewart for his adventures in Bedford Falls at holiday time, but fewer know him for his wonderful, romantic performance in Ernst Lubitsch’s The Shop Around the Corner (1940), a much more graceful movie, and no less touching. Stewart plays Alfred Kralik, a sales clerk in a shop in Budapest during the holidays. He is engaged in a secret pen-pal romance, but discovers to his chagrin that the mystery girl is in fact his annoying new co-worker, Klara (Margaret Sullavan). All this happens amidst an atmosphere of declining business, potential layoffs, and a secret affair with the boss’s wife. Movie fans will recognize the boss, Mr. Matuschek, as the Wizard of Oz himself, Frank Morgan, and William Tracy is very funny as delivery boy Pepi. Though Lubitsch is largely unknown these days, he was quite famous and highly influential in his day, noted for his delicate, graceful “Lubitsch Touch,” which was difficult to describe but easy to spot. He could convey information or humor with a certain visual rhythm that was all his own. A remake by Nora Ephron, You’ve Got Mail (1998), has none of that rhythm, but was a huge hit anyway. Myrna Loy and William Powell are the husband-and-wife Norah and Nick Charles, enjoying their Christmas in The Thin Man. Dashiell Hammett’s detective novel The Thin Man became one of MGM’s most successful movie series of the 1930s, beginning with W.S. Van Dyke’s The Thin Man (1934). Van Dyke used his typical raw, quick shooting style, scrubbing off some of MGM’s trademark polish and finding several wonderful, stolen moments. William Powell and Myrna Loy showed remarkable screen chemistry as husband and wife Nick and Norah Charles, him a boozing, happily retired detective, and her a bored, rich socialite longing for adventure. She encourages him to take on a new case, beginning with a missing person and ending in murder. Maureen O’Sullivan, who had played Jane in Van Dyke’s Tarzan the Ape Man, co-stars as Dorothy Wynant, who hires Nick. The story falls during the Christmas season, and the Charles family—including adorable dog Asta—pauses midway to enjoy a Christmas morning full of presents around the tree. It may not be the most traditional Christmas story, but it’s a great film from Hollywood’s classic era, a perfect blend of comedy, romance, and mystery. Powell and Loy played the characters together in five more Thin Man films. 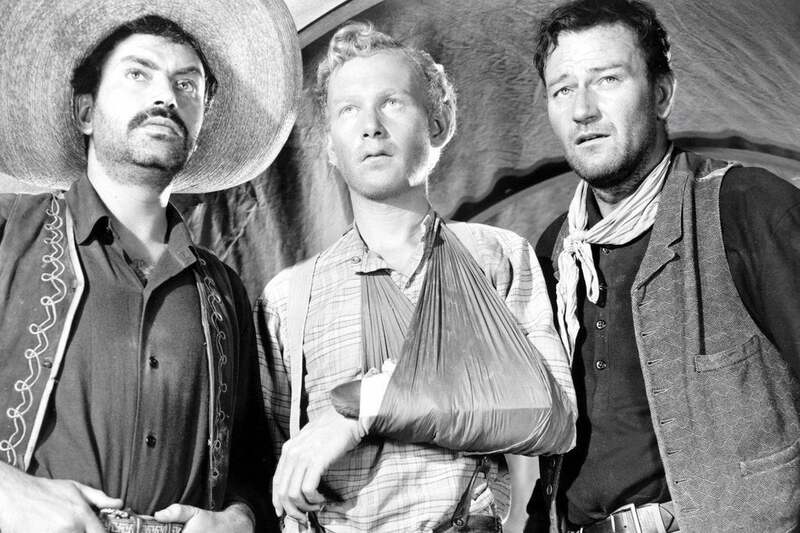 Bandits Pedro Armendariz, Harry Carey Jr., and John Wayne rescue a baby in John Ford’s 3 Godfathers. Though he has fallen out of fashion, there is still a strong argument for John Ford as the greatest filmmaker of all time; he achieved a kind of classical grace that few others could touch. Yet his Christmas-themed, full-color Western 3 Godfathers (1948) is not considered one of his best; detractors say it’s too sentimental. But it’s beautiful and bittersweet and ultimately quite satisfying. John Wayne, Pedro Armendariz, and Harry Carey Jr. play a trio of bank robbers who, after a job goes awry, become trapped and stranded, without water, in the desert. They run across a wagon where an ill, pregnant woman is about to give birth; just before she dies, she names the men godfathers, and suddenly they are forced to learn how to feed an infant, change diapers, etc. It’s surprising how subtly Ford turns the movie to side with the robbers and against the lawmen, effortlessly earning sympathy for the trio. Of course, it’s all an allegory for the Three Wise Men, though there’s nothing much here that’s Christmasy, except a sequence in a saloon, decorated for the holiday, and “Silent Night” playing on the piano. 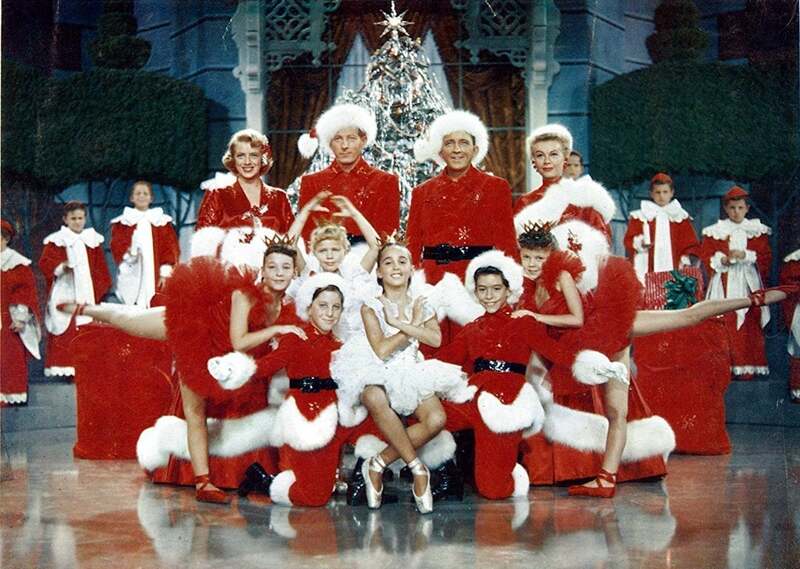 (L to R) Rosemary Clooney, Danny Kaye, Bing Crosby, and Vera-Ellen try to help save a struggling Vermont hotel at Christmastime in White Christmas. 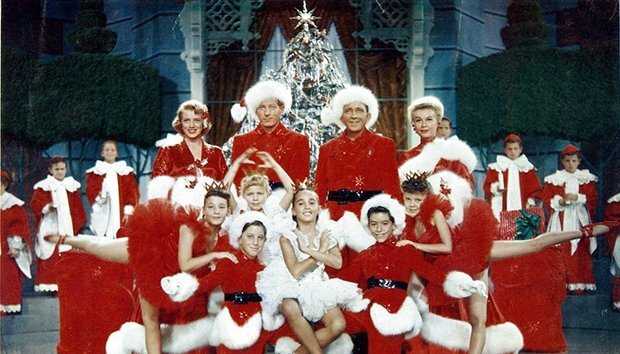 In 1942, Bing Crosby released one of the biggest recorded hits of all time, “White Christmas,” and 12 years later came the official movie, White Christmas (1954), filmed in color and “Vistavision.” Crosby plays a popular singer, Bob Wallace, who is stationed overseas during WWII. During an attack, songwriter Phil Davis (Danny Kaye) saves Bob’s life, and they become partners in peacetime. Teaming up with sister singers Betty (Rosemary Clooney) and Judy Haynes (Vera-Ellen), they decide to put on a show to save their old commanding officer’s struggling Vermont hotel. Director Michael Curtiz’s approach seems a little lethargic at times, the plot relies a bit too much on a ridiculous misunderstanding, and the movie isn’t actually all that Christmasy. But it does have a lovely laid-back simplicity that fits in with what the holiday season ought to feel like. Part of the plot is that the snow actually isn’t falling, and hence we get the equally good song “Snow.” Weirdly, the title song was originally written for the movie Holiday Inn, and though it has a Christmas-themed sequence, it also has a sequence in blackface, and so it’s not shown nearly as often as this one.